1.1. 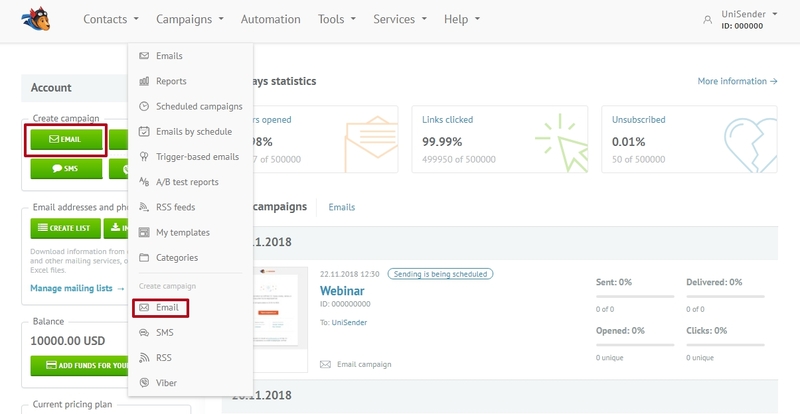 Press the button “Email” (1) or choose Campaigns – Create campaign – Email in your UniSender account. You can set the language of the unsubscribe link in case you sent this campaign to another country and the way of images displayed in “additionally”. 2.1. 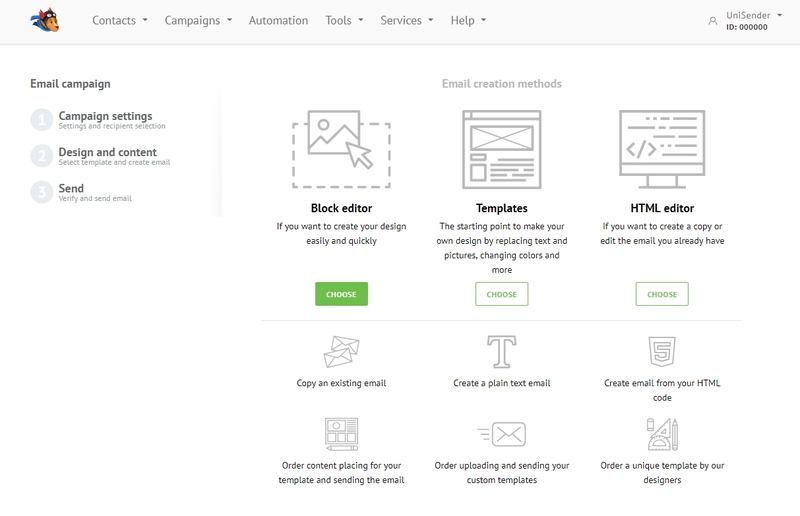 Choose the method of template creation on the step “Design and Content”. 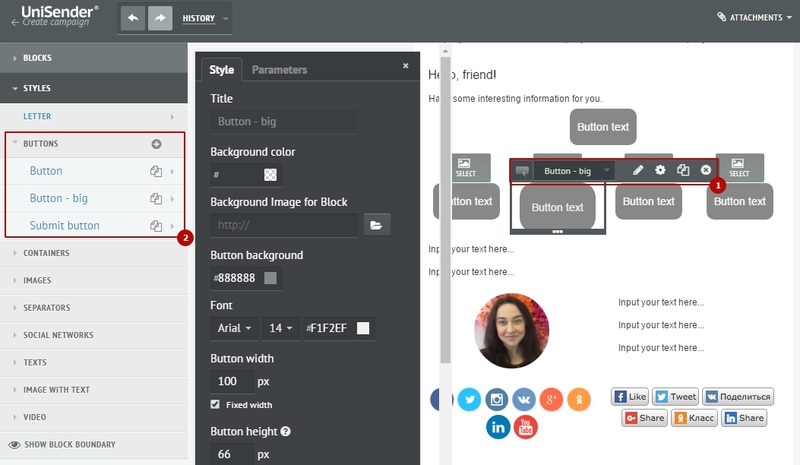 We advise using the simplest one – block editor. 2.2. Choose a completed template or an empty template. blocks are for adding text, images, buttons etc. 2.3.1. Text block. To edit a text block, press the pencil edit button from the top menu that appears after you click on the block. 2.3.2. You can create style presets for text blocks to simplify editing. 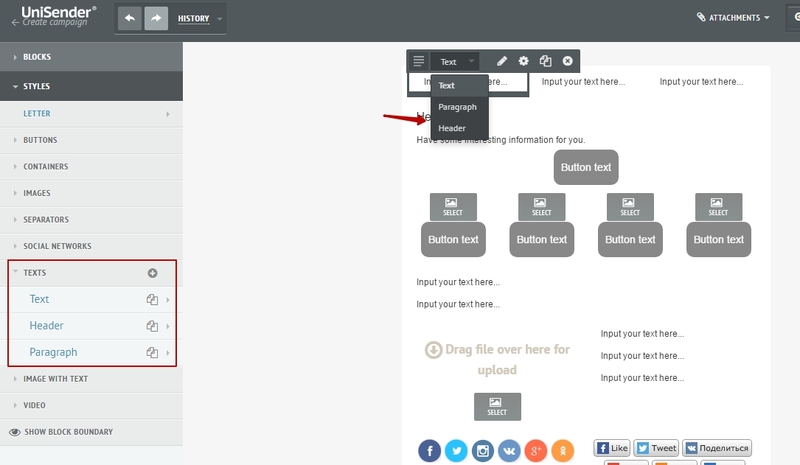 To create several text blocks with the same style – press the Clone button. 2.3.3. Image. By editing a picture block you can drag and drop the chosen picture into the blocks directly or after double clicking, set up picture settings and organize its location in the picture manager. 2.3.4. To open additional settings of picture block, press the gear button. In the parameters list you can set up picture url (to insert it from your server or pick up from picture manager), also here you can set alt-name of the picture and hyperlink URL. 2.3.5. Button. To edit button block you can press gear button (1) or use a quick change via style presets (2). 2.3.6. Social media buttons are represented by the blocks “Follow” and “Share”. 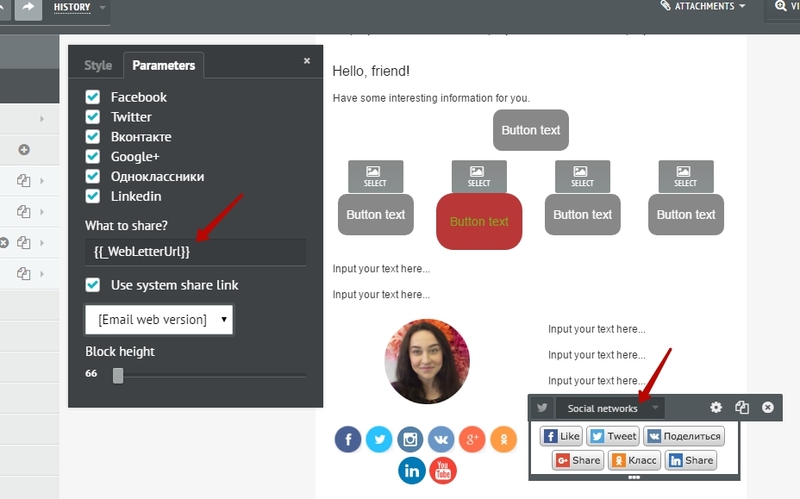 The “Share” block allows you to share your letter in 6 preset social networks; you can select them by pressing on the gear button. You can also specify in the block’s parameters what to share by clicking on the button, either your letter or another URL. 2.3.7. The “Follow” block allows you to put links on your social media accounts. 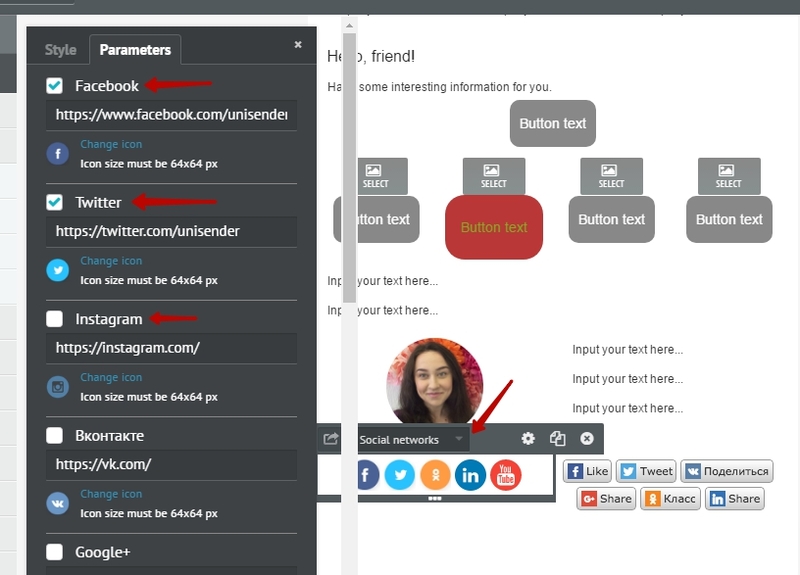 Here you can add or remove social media links and customize network icons. When your letter template is ready press “Save” and “Continue”. 2.4. Set up common styles and parameters for the campaign. 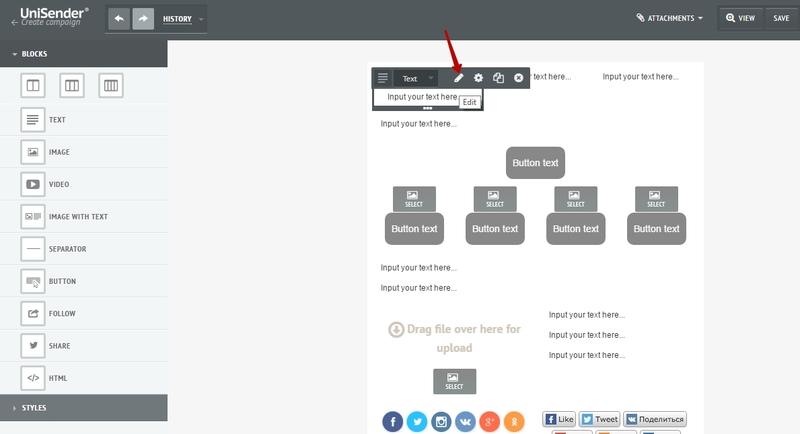 We can, for example, change the width of the template or the color of the links.